Left Front Caliper Mount W/Bolts. 10 1/8" or 10 7/8" Rotor. Left Front Caliper Mount W/Bolts. 10 1/8" or 10 7/8" Rotor. Black. Winters Sprint Car Front Spindle. Aluminum. Straight Snout. With Locknut Kit. Winters Sprint Car Front Spindle. Aluminum. Straight Snout. With Locknut Kit. Black. Winters Sprint Car Front Hub Kit (Left and Right). Aluminum. Direct Mount. Winters Sprint Car King Pin. Hollow. Winters Sprint Car King Pin Cap. Aluminum. Sprint Car Front End Hardware Kit. Sprint Car Thrust Bearing Shim. 030. Sprint Car Thrust Bearing Kit. 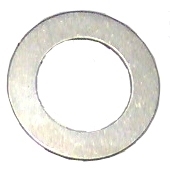 Sprint Car Thrust Bearing Shim. 005.